Daniel Loh: Will Facebook IPO save the market this May? Ever since the start of the month, Dow Jones has been falling from its height of 13,214 points. It has been a 400 points drop to close at 12,820 points last Friday. The drop was sparked by the disastrous Non farm payroll. If you notice the chart in April, it suffers a similar fate. April also drop from 13,200 points to 12,700 points in the first 2 weeks. However in April, it recovered. 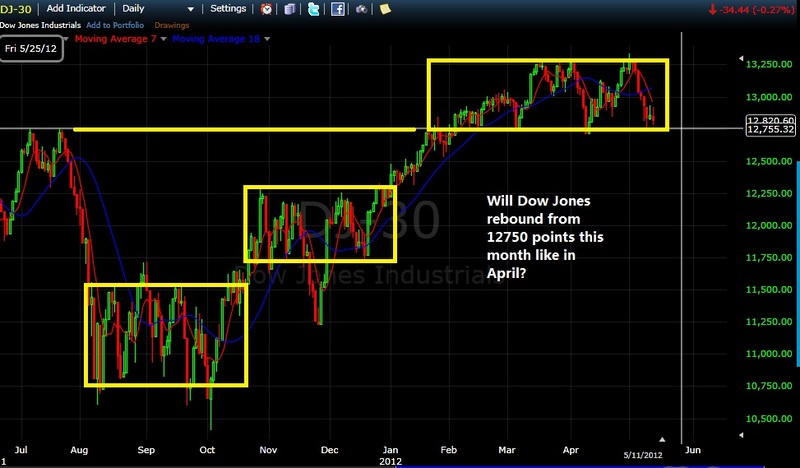 I am now wondering if Dow Jones will have a similar pattern in May. Dow Jones may have reach a support at 12750 points where there is a double top tracking back to last year July. 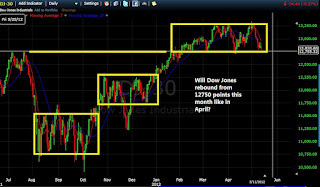 Dow Jones has been consolidating in a box these few months. Let us see if there is a turnaround in May starting from this week. As Facebook IPO is scheduled on Friday (pending approval from exchange), this should be the main focus this week! And I suppose some days this week, we shall see a bit of enthusiasm from Wall Street. I am preparing my ammunition if I see any strong rebound. Like in the past article, what do I meant by rebound? A more than 100point, triple digit rise in Dow Jones is the Spark that is needed. I am looking for it last week, but Dow Jones did not have a 100 points increase. Let us see how this week goes. Btw we will have a FREE SEMINAR for you!! on 15 May (Tue) English Session OR 16 May (Wed) Chinese Session.